Credentialing bodies such as the AICPA, the ASA, and the NACVA have done much in recent years to improve and standardize appropriate valuation practices, yet there are many report writers still using outdated or questionable methodology. One very popular online business valuation service produces a report that has completely undocumented conclusions. 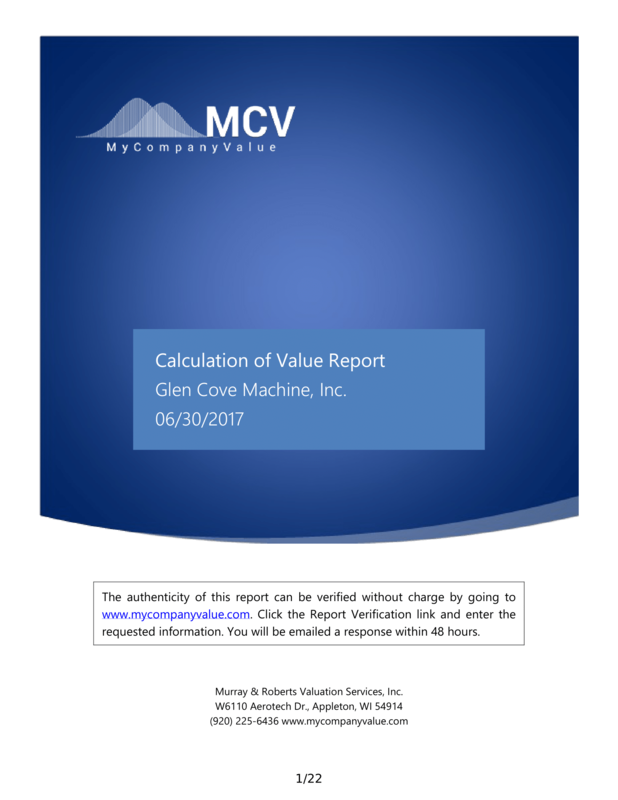 The report is full of comparisons of the company’s financial statement data to industry averages, but it does not document the actual calculation steps applied to arrive at your business’s value. A solid business valuation is thoroughly documented with nothing left to mystery. 2. Use of Arbitrary Factors. One of the practices that I consider less reliable or even out of date is the Guideline Company Method. It’s the ‘old-school’ method applied under the Market Approach. In that method an expert finds the single most comparable publicly traded company available and uses its value as the basis for determining the value of your company. For small companies, using a guideline company is impossible because there are no companies that are publicly traded in its size range. Unfortunately, many valuation experts see the guideline company method as the only method available under the market approach, and therefore will not use any comparable sale information in their small company valuations. The use of the Excess Earnings Method in business valuation is another ‘old-school’ method which is slowly becoming extinct, principally because of its highly theoretical and poorly documented nature. When determining the value of your company, an expert will apply multiple approaches using independently determined variables. This is not unlike the appraisal of a house, where the appraiser considers a property’s rental value, the cost to construct new, and what similar properties have recently sold for. Using different approaches with independent variables gives the final conclusion of value much more credibility. More often than not, use of the Excess Earnings Method is little more than window dressing. First, the method itself is purely theoretical. It attempts to measure the return on investment required on the equipment invested in the enterprise, as though that were somehow different than the return on investment required for the enterprise itself. In the real world, companies buying equipment use their own investment criteria, which is ultimately derived from their long term capital structure and required rate of return to equity. There is no universal equipment rate of return based on market derived data. The expert inevitably includes some arbitrary data to determine the appropriate rate of return on equipment. Second, some of the factors used in the approach (such as normalized cash flows, the discount rate applied to the excess earnings, and the fair market value of equipment) are the same factors used in other approaches. Use of the approach gives the illusion of an independently determined value, when it is not. Holdouts to this practice argue that if the tax isn’t paid at the corporate level, then it’s paid at the shareholder level. This is false. Some corporations’ earnings are subject to double taxation and others (S corps) are not. Dividends received from corporations that pay the corporate income tax (C corps) are subject to a lower tax rate at the shareholder level, but this should be taken into account when valuing the earnings of the C corp, not the S corp. The company value arrived at under the income approach includes all capital required – including working capital (working capital is total current assets less total current liabilities). An expert must make some effort to determine the amount of working capital a rational investor would expect the company to need, and compare that amount to the working capital on hand as of the valuation day. This can be found by applying size appropriate industry average data to the subject company. Large working capital adjustments are not uncommon. In every business acquisition I have worked on, there has been language in the purchase contract discussing the extent to which working capital items were included in the purchase price. Mergerstat publishes data summarizing premiums paid in public company acquisitions, and labels these premiums as ‘control premiums.’ These premiums supposedly represent the premium a buyer is willing to pay to acquire a controlling interest in the target company. According to valuation industry expert Shannon Pratt, these premiums actually represent the synergistic opportunity the buyer expects to derive by combining the assets of the acquired company with their existing assets. According to Pratt, the financial benefit of control in most public companies is very small. Therefore, the equity returns used in developing the discount rate do not need to be adjusted for the benefit of control. The benefit of control should be determined by adjusting the normalized cash flows for the owner’s control items (excessive salaries, rents, benefits, etc.) If the valuation is based on controlling cash flows, applying a control premium to the stock or discount rate is a clear error. Hiring an expert who has been certified by the AICPA, ASA, or NACVA should minimize the chance you’ll see these kind of errors, but will not eliminate it. Experts need to continually educate themselves on the best practices used, read competitors reports, and have merger and acquisition consulting experience. Nothing can replace the experience gained from participating in direct negotiations with buyers and sellers. Frequently these negotiations will include discussions over the value implications of many individual adjustments.